Kiger Hansen is a NYC based designer who is working to raise awareness for his awesome Kickstarter Campaign the k5-jkt, an essential jacket that all urban rebels and tech geeks need to help make their way through their hectic urban jungle. 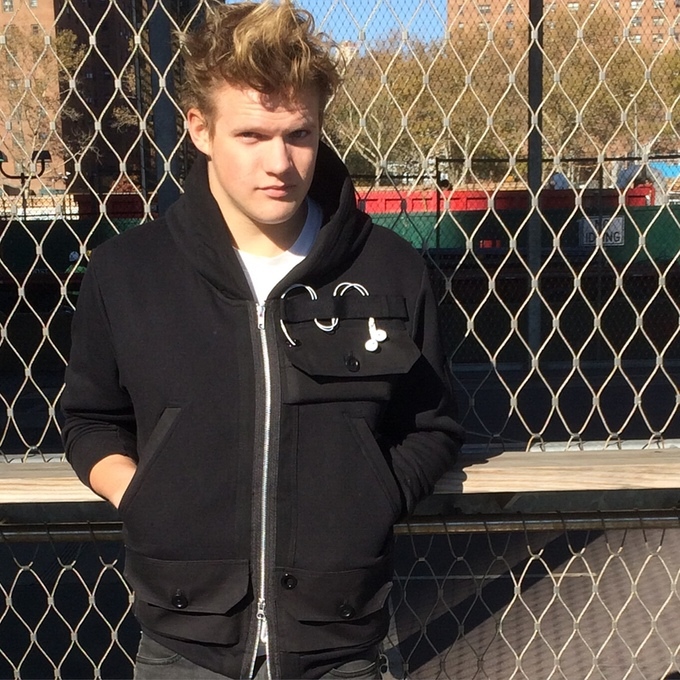 This utilitarian sweatshirt hoodie holds all sized smart phones and an iPad-mini! This baby also has a Velcro tab that will keep your headphone wires in place, as well as tangle free. He is working to raise $60,000 by March 11th and he needs our help! 1. The Velcro: A tab stitched with a 100% rayon twill braid with a handle that will hold the headphone wires in place and tangle free . At the fold of the braid it will secure the headphone wire from the grommet and will give mobility as well as hold it in place at velcro. 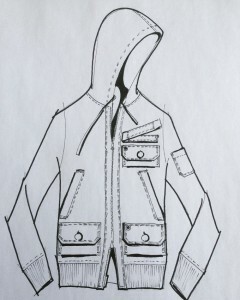 The Velcro idea, I was inspired by a vintage fisherman’s vest. 2. The Metal Grommet. 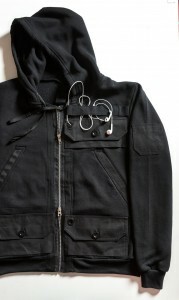 A passage for the headphone wire from the pocket flap, that will fit all headphone wire plugs. 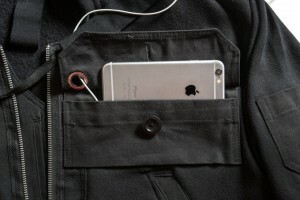 There are two grommets, one on the chest pocket and also another on the lower waist pocket for bigger smartphones. 3. All About the Pockets! All pockets are made from a woven fabric that is similar to an military canvas fabric. The chest and both waist flap pockets are constructed like an envelope. 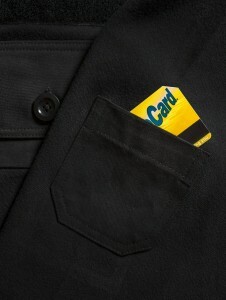 Bottom hem of the pockets are not stitched to the body of the jacket. It is open for comfortability and easy access to the smart phones. 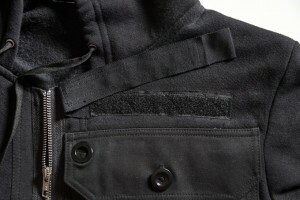 Pockets are stitched down at both sides to the body of the jacket. 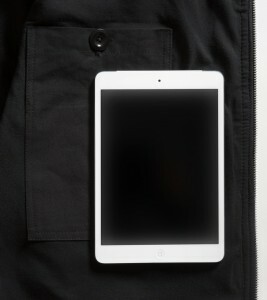 Plus, inside the wearer’s left side is a pocket that will fit a iPad-mini. 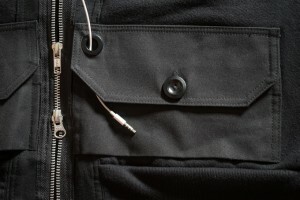 At center front a YKK double zipper with exposed zip tape, that opens and closes in opposite directions for the wearer’s comfort. A patch pocket on wearer’s left bicep sleeve for small incidentals. The side pockets are deep enough that you can fit up to your mid forearm.